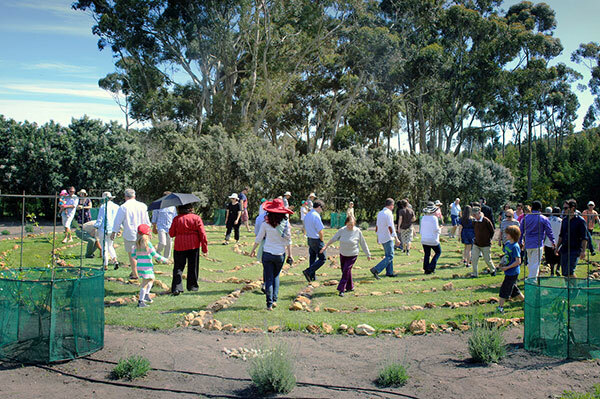 When we have guests on the farm, I like to lead them from lunch to the labyrinth at the bottom of the olive grove below the homestead. Not only is a post-prandial stroll invigorating and good for the constitution, but I love to see how people experience walking the labyrinth. It is tragically human to be tricked by looks. And it’s human to project an image, carefully calculated to communicate what we want by adorning ourselves – this is one of the things that exemplifies cognitive ability and what separates us from other animals. We all partake in this game, despite the fact that we know it’s all an elaborate ruse – a way of hiding who we really are. Only through observing instinctual behaviour is the true character beneath the skin revealed. When my youngest boy ran onto a rugby field for the first time about five years ago, I was intrigued to see how he would react when faced with a boy twice his size bearing down on him. I’ve tried not to put any pressure on him to perform in sports. I’d rather he performed well in the classroom and learnt to love poetry and write computer code with equal enthusiasm. But that day, I couldn’t hide my fascination – what lay beneath this young boy’s posing I wondered? What lurked deep in his soul? I discovered a lot about him that day and it gave me great hope for his future. Unfortunately, we returned home with a broken collar bone, which caused a bit of discomfort for a while, and added credence to my wife’s view that rugby is somewhat barbaric. 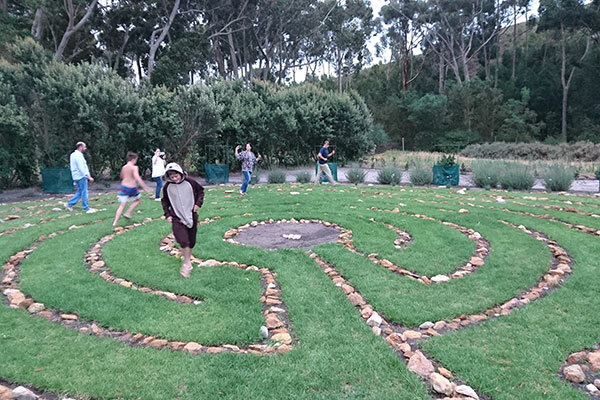 Unless you step on a sunbathing puff adder, walking the labyrinth is much safer, but just as revealing. Some people are tentative, but most rush in, keen to discover a new experience. A labyrinth mirrors our journey in life. The concept is to follow the path to the middle and then retrace your steps to get out again. It isn’t a maze. There is a clear footpath, but it doesn’t go where you expect and this mirrors our real life confusing experience of what we think is Free Will and Chance. Guests usually stride purposefully onto the pathway which apparently heads straight to the middle, but then as you walk along it moves you back out to the edge, away from the centre. That’s a bit frustrating, but just as you are losing hope, the path swings back to the middle. The goal is reassuringly in sight. Indeed the path soon leads you right up to the middle. If you leant over you could touch the centre stones – then inexplicably it takes you away – away from that goal, so tantalisingly close. It is at this point that guests start behaving truthfully. Somehow the labyrinth’s path has stripped them of their exterior armour. Some look desperate, unable to compute how something so benign-looking can make them feel powerless and disorientated. They pause, vexed and distracted. They look behind them or try to follow where the path is heading, but it isn’t that easy. Others fixate on the road ahead and don’t break stride; in fact they walk with more purpose, if not enjoyment. A few just shrug their shoulders, have another sip of wine (we normally walk the labyrinth with a glass) and give up, turning around and retracing their steps – or even walk across the demarcating stone walls and out, without even following the path. A very few seem totally at ease. They are in the moment, enjoying the walk – the soft grass under their feet, the wind in the blue gums sounding like silk being pulled across your ear. Most wonderful is to watch young kids. They run into the labyrinth and skip along the path with beautiful abandonment and obvious joy. When the path seems to be leading them in an unusual direction they all seem to laugh or squeal with eagerness, apparently unperturbed. This says a lot about the complications that come with adulthood. Every time I walk the labyrinth – and I walk it a lot – I suffer the same turmoil, the same disorientation; almost anxiety, as the path takes me away from my goal. But I’ve learnt a coping mechanism over the years. I just relax and try to enjoy the journey, believing it will work out in the end. This doesn’t come naturally, but I’ve found with enough focus I can walk with lightness and belief, and immense fulfilment follows. And an extraordinary thing has started to happen. Instead of feeling infinitely wiser as an older winemaker, the labyrinth experience has trained me to be calmer in my craft. Like life, winemaking is a journey. Like life, it isn’t fair. In fact it can be an extremely frustrating and heat-breaking endeavour, especially when your goals seem unattainable. But it is also a beautiful journey. My role is to lead a team in the crafting of beautiful wine – wine that brings a bit of joy to the world. And when that happens, it feels relevant and true.